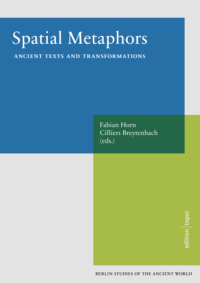 In presenting philological readings of spatial metaphors in ancient texts and their reception based on theoretical approaches to metaphor, this is a pioneering study which also bears testimony to the increasing interest in the potential and cognitive functions of metaphor in literary studies. The individual studies offer a representative synopsis of current theories on spatial metaphors and encompass applications to literary texts from a number of genres and languages ranging from wisdom texts and philosophical treatises to tragedy and from Ancient Egyptian to Shakespearean English, thus spanning almost 3000 years of human thought and language. Based on this framework of theory and practice, this volume collects a series of papers originally delivered at a conference entitled Raum-Metaphern in antiken Texten und deren Rezeption, organized by research group (C-2) Space and Metaphor in Cognition, Language and Texts of the Excellence Cluster 264 Topoi — The Formation and Transformation of Space and Knowledge in Ancient Civilizations in Berlin in June 2014.